One of our favorite family vacations , when we can afford it. is Mardi Gras. We are fortunate enough to have friends in New Orleans that are gracious enough to let us stay with them when we head south to celebrate Carnival. Mardi Gras is billed as the the “Greatest Free Show On Earth,” and draws hundreds of thousands visitors every year. This is in spite the fact that the City of New Orleans spends little or no money to promote it. 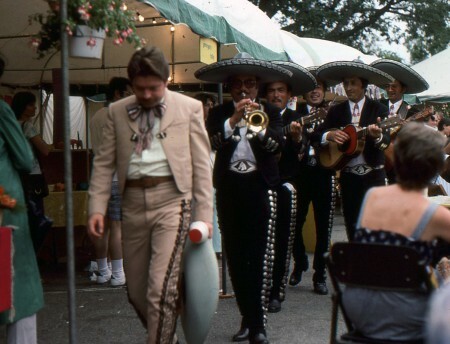 Also Mardi Gras is one of the few entertainment venues where the entertainers foot the bill. By tradition and law Mardi Gras parades can not be sponsored by any corporation. Carnival clubs( Krewes) are chartered as non profit organizations. They raise money for costumes, float decorations, and throws, (beads, cups and doubloons tossed to parade watchers,) through dues to members and various fund raisers throughout the year. Friends that live in New Orleans tell me that only administrative function performed by the city of New Orleans is issuing parade permits to applicants. It is still a mystery to me how the parade times and routs are coordinated. 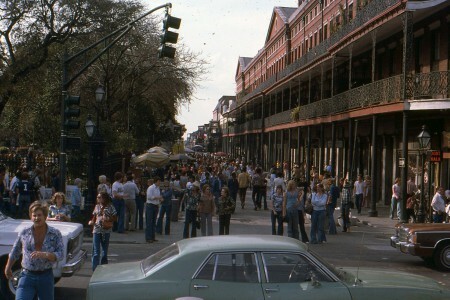 The only parade restriction that I am aware of is the ban on parades in the French Quarter. 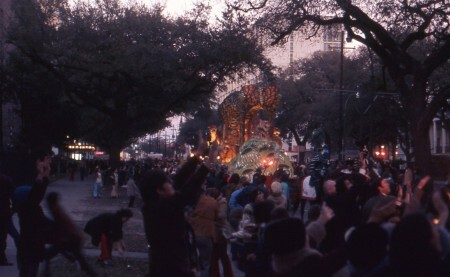 This ban was established in 1973 because city police and fire officials felt that the large floats and the crowds that gathered to watch them, rendered the narrow streets unsafe. 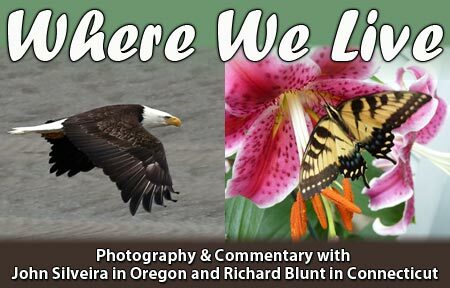 I have been attending this wonderful party since the the mid 70s. In my attic I have several shopping bags full of throws from almost every parade except one. I have yet to be fortunate enough to be on the receiving end of what I consider the ultimate Mardi Gras prize–a Golden Nugget. These are beautiful, hand crafted coconuts that are usually handed, instead of thrown, from the floats of the Zulu parade. Over the years there has been a proliferation of law suits from people alleging injury from coconuts being distributed from these floats. 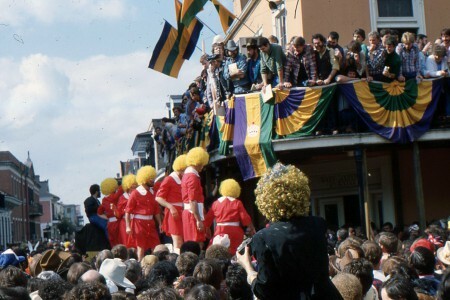 In July of 1988 the Louisiana Legislature passed, and the Governor signed into law, the Coconut Bill.This legislation excluded coconuts from liability for alleged injuries when being handed from Zulu floats. My resolve is to receive of the treasures on a future visit to this grandest of celebrations. Our family Big Easy visit was canceled, this year, by the 34 inches of snow that mother nature dumped on the east coast on Feb 9th and 10th. Unfortunately, the blizzard also forced a plan change for this post. 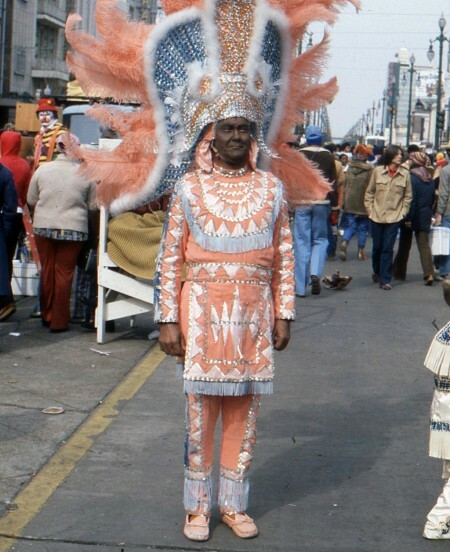 I have decided to share, with you, some of our favorite times in years past as we celebrated Carnival on Fat Tuesday. Most of what you see here is repeated in refreshed fashion every year during Carnival, and presented in grand fashion during Mardi Gras. 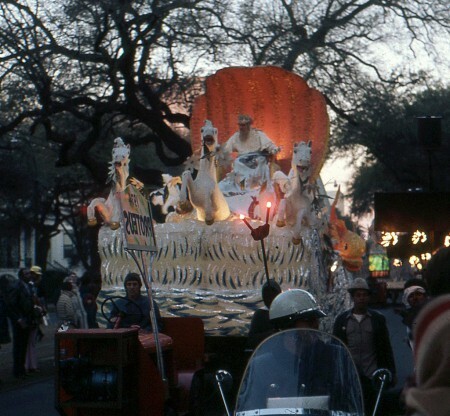 For twelve days and nights the streets in and around New Orleans are alive with magnificent float displays like this. 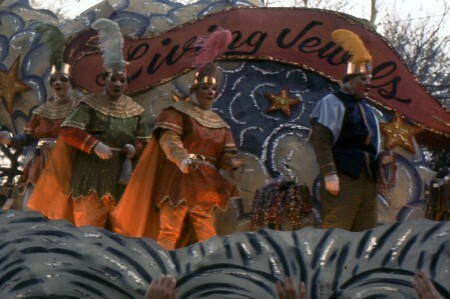 The masks worn by the krewe members on this float indicate that they are members of the Living Jewels Secret Society. 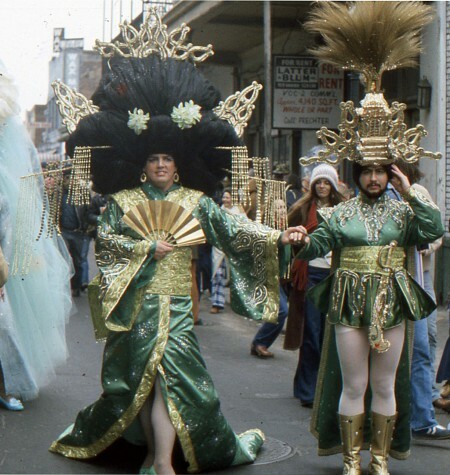 The streets of the French Quarter are filled with folks wearing custom made costumes like the one in this picture. These costumes are usually made of the finest of material and often hand crafted by the owner. The diversity of costumes is endless. 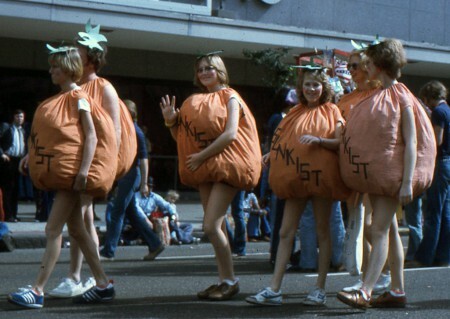 Elaborate costumes like these are the property of the wearers. They are not sponsored by any company or organization. 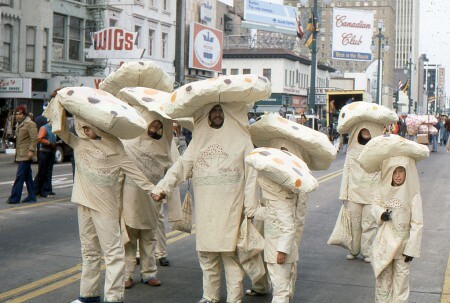 This is one example of the Family nature of Carnival in the Big Easy. There is fun for everyone. 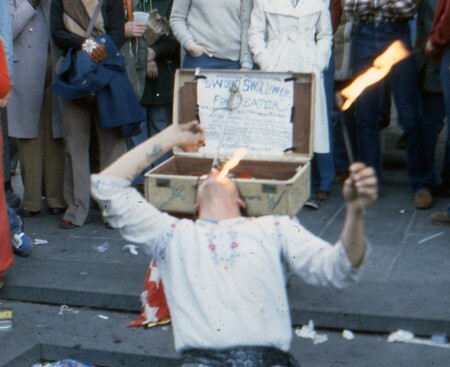 Where else can you find a sword swallower/fire eater on the street at 6:30 in the morning. 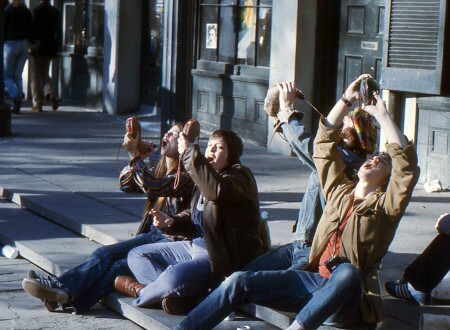 Tricia (crouched down on the left in the first photo) on was terrified that he was going to cut himself. 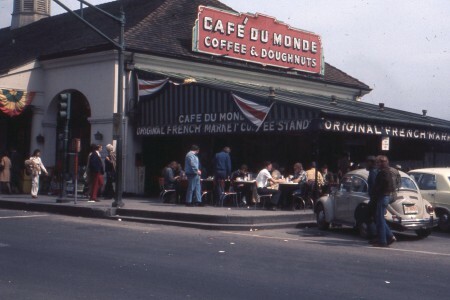 The Cafe´Du Monde is a famous coffee shop, in the French Quarter featuring beignets, a deep fried pastry served in threes with powdered sugar. These delightful treats are served with a cafe´au laÍt. This coffee with milk delight treat blended with chicory, which adds more than just a little flavor boost . It is here that many Mardi Gras celebrants including the Blunt family start the day’s party. 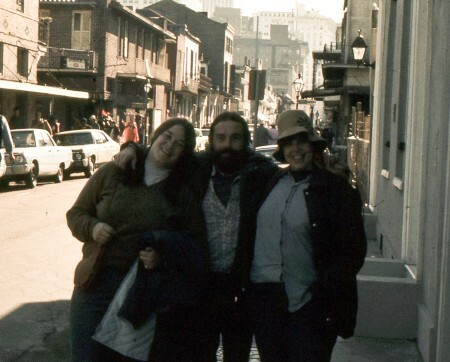 My wife Tricia (on the right) stands, on a cold morning, with our Mardi Gras hosts of 1978, my long time friend Joe and His wife Michelle. The best way to experience Carnival is with good friends. 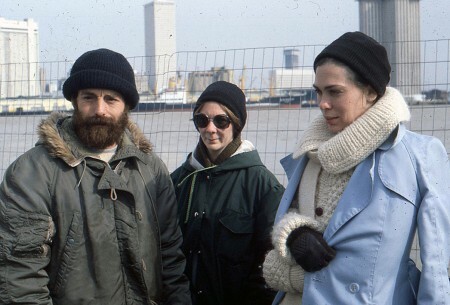 You have already met Joe, in the center. On right is another friend from Boston Jeanie. On the left is one of Jeanie’s close friends. 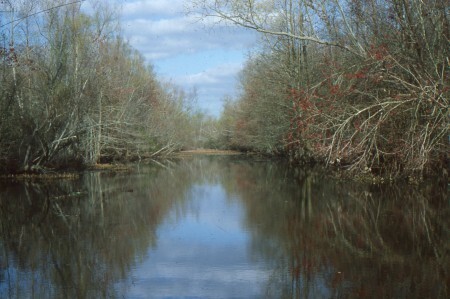 My friend Joe loves to travel the Louisiana back waters and, on a few occasions, he invited Tricia an I to go with him. I found these water ways to be inviting, and quite, and the fishing is great, when you know what to fish for. Joe knows it all. 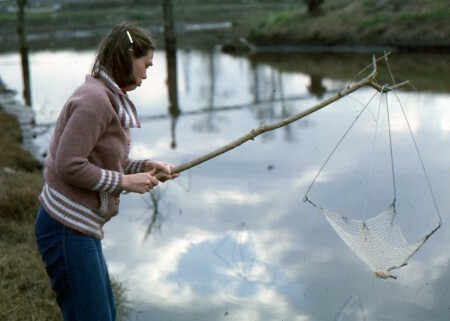 bThis was the third time Tricia lifted an empty crayfish net from the water. As you can see, she is not happy. After listening to a few tips from Joe, her net started to fill. 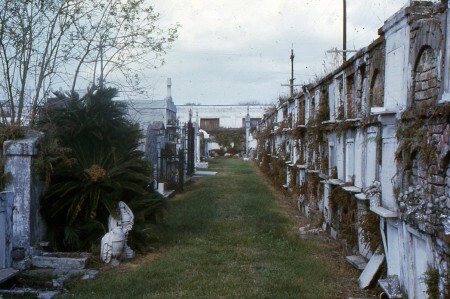 An above ground New Orleans cemetery. Living below the waterline of a big river does call for creativity.